A new kind of fruit has been making its debut in produce depot fruit section. Pluots are a cross between Apricots and Plums. This fruit was invented in the late 20th century by Floyd Zaiger. Pluots are now grown parts of Washington and California. They are sometimes called “dinosaur eggs” and have smooth skins like plums. Pluots have an intense flavour like a blend of fruit juices – in this case it would be apricot and plum juice. Did you know that pluots are a great source of Vitamin A which is necessary for healthy skin and mucous membranes. Pluots are also high in Vitamin C which is necessary to help maintain healthy gums, connective tissue and boost the immune system. 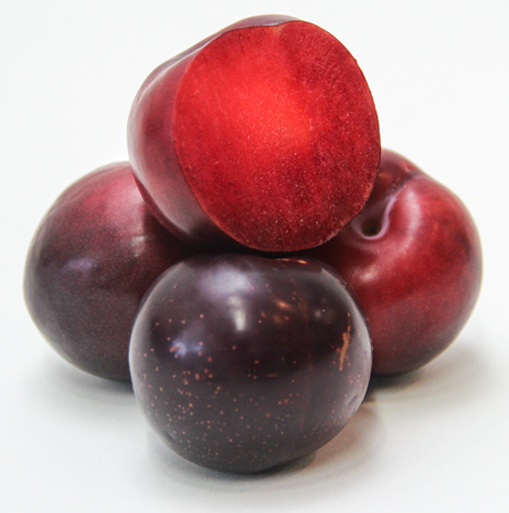 Look for pluots that are plump, have a consistent skin colour and are firm in texture. Pluots should be heavy for their size and have a smooth lustry skin. Avoid fruits that have soft spots or ones that are green in colour. Pluots are very juicy and very sweet which makes them an easy fruit for kids to love. Try serving pluot chunks on their own, with yogurt or with a low fat ice cream. Pluots are great in baking as a sweetener, sliced into salads, cooked as sauces or made into smoothies and soups. Wash the fruit well and carefully under cold running water before using. To remove the pit, cut the fruit in half and pull the pit out. To ripen pluots, place them in a closed paper bag at room temperature. Store ripe fruit in the crisper bin of the refrigerator for one to two days.